If you want to catch fish, have a great time, and be pampered! 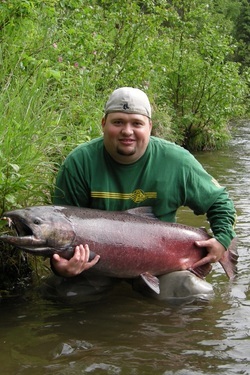 Matt Peterson with Valley River Charters is your guide! I say a picture is worth a thousand words...take a look! Matt created a memory our family will always treasure! Can't wait to get on the river with Matt again this year! 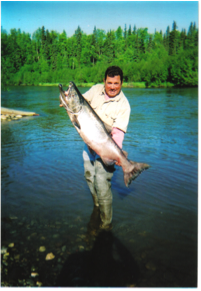 You sincerely will not be disappointed with Valley River Charters! Fish on! 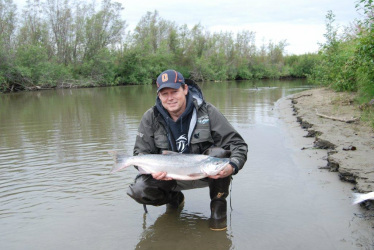 "I've been fishing with Matt for 7 years now, for both silvers and kings. He is by far the best guide on the Little Su. No one knows the river like he does. He knows every hole there is, and will work extremely hard to get you on fish, you just need to know how to reel 'em in! Matt's great with kids and all levels of fisherman, from beginners to experts. He lets you fish how you want. Always welcomes your requests, and is very patient. Extremely knowledgeable and reliable. You won't be disappointed!" ... 10 mins into first trip with Capt Matt of Valley River Charters I hooked and landed a 50 lb king !!! Since then I have fished 15 plus trips over 7 yrs for silvers and kings with the same great success. My annual trip up to Alaska wouldn't be complete without fishing a few peaceful days on the Little Su with Matt.